Despite ongoing tensions with Pakistan, the Indian government on Saturday issued visas to Pakistani actors Adnan Siddiqui and Sajal Ali. Ever since Indo-Pakistan relations deteriorated due to incendiary statements from political personalities from both sides as well as cross-border firing, Pakistani artists have been forced to leave India. Fawad Khan and Mahira Khan were unable to promote their films and had to leave India after the Uri attack in light of threats from rightist Hindu groups. 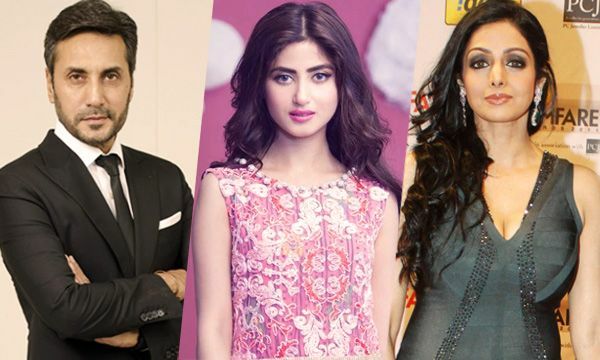 However, the Indian government on Saturday issued visas to Pakistani actor Adnan Siddiqui and actress Sajal Ali, according to reports. Sajal and Adnan will shoot for Mom, a woman-centric film which is produced by Bollywood diva Sridevi. Sridevi will also play the central character in the movie. According to media reports, Adnan Siddiqui will play Sridevi’s husband while Sajal Ali will play her daughter. Actor Akshaye Khanna is also expected to make a comeback in the movie and Nawazuddin Siddiqui will also have a cameo appearance in the flick. Shooting for the film has already begun. Adnan Siddiqui has already worked with Hollywood actress Angelina Jolie and Irrfan Khan in the 2007 movie A Mighty Heart.